Corporate Communications – Insight Strategic Communications, Inc.
A corporate spin-off creates two types of internal communication needs: build understanding for why it’s happening and tell what comes next. When Acuity Brands spun-off from NSI, they needed both. 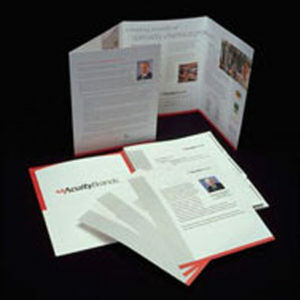 We created communication to help explain the change and a start-up investor relations kit for the new Acuity Brands. Then it was time to share the vision for the new company. The Acuity Brands Way was a code of beliefs written by the senior leadership team. Our role was to create the communications strategy for sharing it with managers and team members. The employee population numbered nearly 8,000, mostly hourly team members who were located on three continents and spoke five different languages. We developed a downloadable toolkit for managers that included a discussion guide, cascade plan, presentation, FAQs and examples of how to bring the document to life in their workplace.